After the death of Edward VI. he joined the exiles abroad, and took up his residence at Zurich, where he remained till the death of queen Mary. 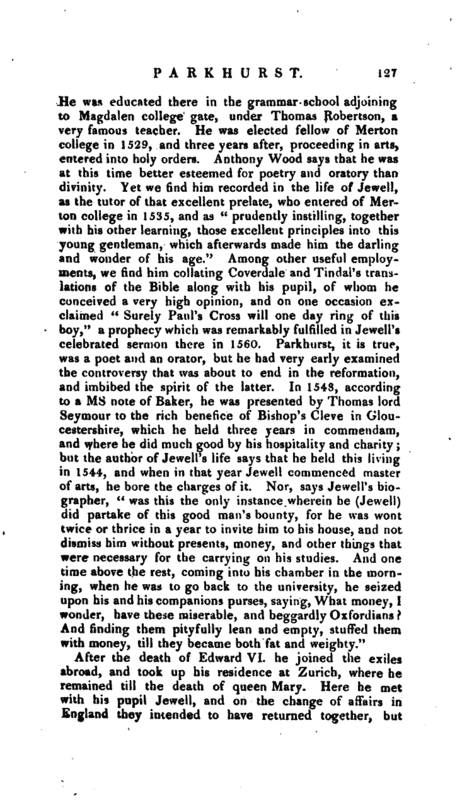 Here he met with his pupil Jewell, and on the change of affairs in England they intended to have returned together, but | Parkhurst, thinking that Jewell had not chosen the safest route for his travels, left him and went by himself, the consequence of which was that Parkhurst was robbed of all he had on the road, and Jewell arrived safe in England, and had the satisfaction of relieving the wants of his former benefactor. Soon after Parkhurst arrived, he was elected to the see of Norwich April 13, 1560, and consecrated by archbishop Parker, &c. on Sept. 1. He held the living of Cleve for some time after this along with his bishopric. He now married Margaret, daughter of Thomas Garnish, of Kenton in Suffolk, esq. by Margaret his wife, daughter of sir Hugh Francis, of Giffard’s Hall in Suffolk, knight. In 1566, by virtue of a commission from the principal ministers of the university of Oxford, directed to Laurence Humphrey, the queen’s divinity professor, he and four other bishops were created doctors of divinity, Oct. 30, in the house of one Stephen Medcalf in London, in the presence of William Standish, public notary and registrar of the university, and others. 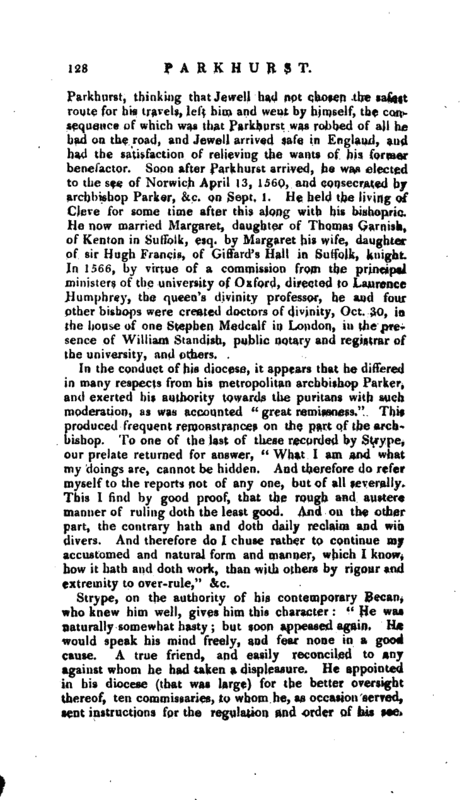 In the conduct of his diocese, it appears that he differed in many respects from his metropolitan archbishop Parker, and exerted his authority towards the puritans with such moderation, as was accounted “great remissness.” This produced frequent remonstrances on the part of the archbishop. To one of the last of these recorded by Strype, our prelate returned for answer, “What I am and what my doings are, cannot be hidden. And therefore do refer myself to the reports not of any one, but of all severally. This I find by good proof, that the rough and austere manner of ruling doth the least good. And on the other part, the contrary hath and doth daily reclaim and win divers. And therefore do I chuse rather to continue my accustomed and natural form and manner, which I know, how it hath and doth work, than with others by rigour and extremity to over-rule,” &c.
Strype, on the authority of his contemporary Becan, who knew him well, gives him this character: “He was naturally somewhat hasty; but soon appeased again. He would speak his mind freely, and fear none in a good cause. A true friend, and easily reconciled to any against whom he had taken a displeasure. He appointed in his diocese (that was large) for the better oversight thereof, ten commissaries, to whom he, as occasion served, sent instructions for the regulation and order of his see. | He could have been willing to allow a liberty of officiating in the church, to such as could not conform to some of the ceremonies of it, looking upon them as indifferent matters; but upon command from above, he readily obeyed his prince’s and metropolitan’s authority. He was a friend to prophesies; that is, to the meetings of the ministers in several appointed parish churches in his diocese, as in St. Edmund’s Bury, &c. to confer together about the interpretation and sense of the scriptures. But the queen forbidding it, upon some abuses thereof, the archbishop signified to him her will, and he in obedience sent to his archdeacons and commissaries, to have them forborn for the future.” “As for his life and conversation, it was such as might be counted a mirror of virtue; wherein appeared nothing but what was good and godly; an example to the flock in righteousness, in faith, in love, in peace, in word, in purity. He preached diligently, and exhorted the people that came to him. 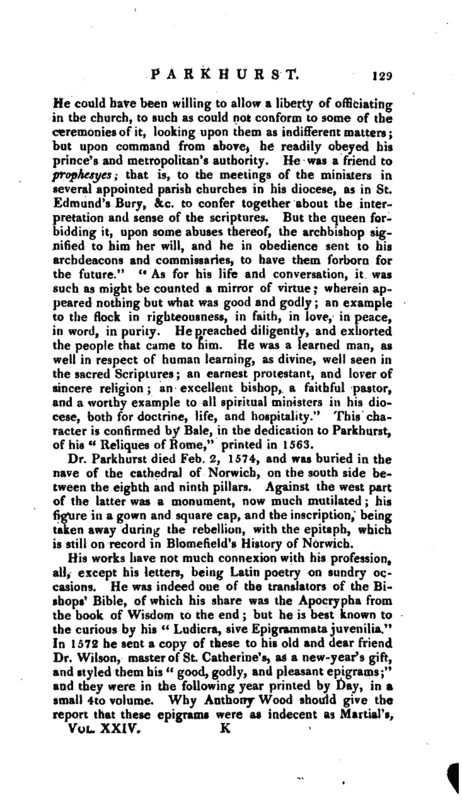 He was a learned man, as well in respect of human learning, as divine, well seen iti the sacred Scriptures; an earnest protestant, and lover of sincere religion; an excellent bishop, a faithful pastor, and a worthy example to -all spiritual ministers in his diocese, both for doctrine, life, and hospitality.” This character is confirmed by Bale, in the dedication to Parkhurst, of his “Reliques of Rome,” printed in 1563. 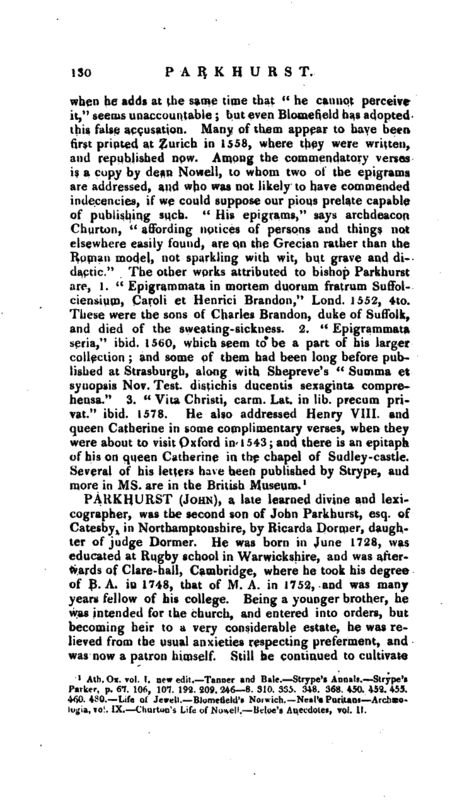 Dr. Parkhurst died Feb. 2, 1574, and was buried in the nave of the cathedral of Norwich, on the south side between the eighth and ninth pillars. Against the west part of the latter was a monument, now much mutilated; his figure in a gown and square cap, and the inscription, being taken away during the rebellion, with the epitaph, which is still on record in Blomefield’s History of Norwich. 1 Ath. Ox. vol. I. new *di>. Tanner and Bale. —Strype’s Annal?. —Strype‘ Pnrk-r, p. 67. 10*, 107. 19’2. <209. ‘246 8. 310. 335. 348. 368. 450. 452. 455. 4nO. 4hO. Life of Jewell. Bloint-a^ld’s Norwich. Neal’s Puritan* ArchaeuT,. IX. _ Churtnu’s l’f 'f Nowell. 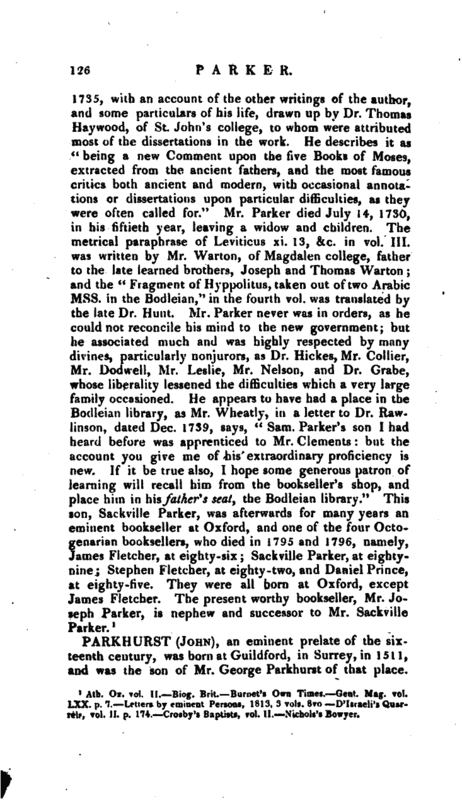 Beloe’s Anecdotes,ol. II.